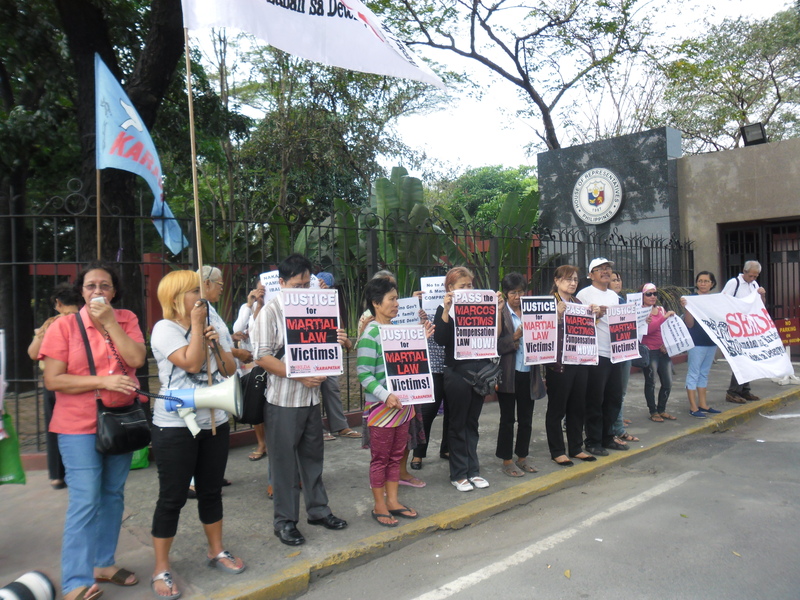 Martial Law victims held a rally outside Batasang Pambansa on Wednesday while the bicameral conference committee “harmonized” the Lower House and Senate versions of the bill to indemnify victims of martial law to craft the final version into a law. SELDA also said that only considering as human rights violations victims during martial law those who “peacefully exercised their rights against the dictatorship” is clearly excluding those who resisted the violations during the white terror years and sends a very dangerous signal to the perpetrators of human rights violations that theperpetrators can do what they like to people considered as not “peacefully” exercising their civil and political rights. This provision also opens up a problem of who will and how will the “peaceful” exercise be determined. Further, even the UN Declaration of Human Rights, which the Philippine government subscribes to, does not specify how the rights will be exercised. January 16, 2013 | Categories: Press Releases | Tags: $680 million Marcos Swiss deposit, Bantayog ng mga Bayani, Batasang Pambansa, Edgar Jopson, Emman Lacaba, Imelda Marcos, Joker Arroyo, Lorena Barros, Lower House, Marcos assets, Marcos ill-gotten wealth, Marcos indemnification bill, Marcos Victims' Compensation Bill, martial law, Senate, UN Declaration of Human Rights, US Federal Court System | Comments Off on Martial Law victims to bicam: No more delays, enact “pro-victim” bill now! Karapatan secretary general Cristina Palabay said Aquino and both houses of Congress should not delay the immediate passage of the acceptable version of the law, have it passed and signed into law before it gets frustrated again with the frenzy for the upcoming election period. “Since the landmark judgment in Hawaii on the class suit against Marcos, several sessions of Congress have been remiss in rendering justice and indemnification for Marcos victims through the appropriate legislative measure. Aquino should certify this as an urgent measure,” she commented. The House of Representatives and Senate have formed a bicameral conference committee to deliberate on versions of the bill from both houses. Palabay noted that there were “snags” encountered during the debates of the bicameral conference committee, citing the positions of Sen. Joker Arroyo and Akbayan Rep. Walden Bello which the group deems as “pro-Marcos” views, as the points of debates they inject in the bicameral meetings go against the principle of the proposed law, which is to render justice and indemnification to Martial Law victims. “Both lawmakers denigrate the persevering efforts of the victims when they disregard the judgment of the US court in the landmark class suit against the Marcos. By asserting that there should be ‘disputable presumption’ for all victims, they are providing the Marcoses with another malicious legal tactic to contest the judgment in Hawaii, which found former Pres. Ferdinand Marcos guilty of rights abuses during Martial Law. This proposal is clearly in favor of the Marcoses,” Palabay explained. Palabay said Karapatan and the Samahan ng Ex-detainees Laban sa Detensyon at Aresto (SELDA), a group of former political prisoners which led the filing of the class suit in Hawaii, insist that “conclusive presumption” should be given to the 9,539 victims who filed and won the class suit in Hawaii to give due and appropriate recognition for the ‘guilty’ judgment on Marcos. Karapatan also said the two legislators should be reminded of the principle enshrined in the United Nations Universal Declaration of Human Rights (UN UDHR) that recognizes that right of peoples, who are confronting tyrannical and oppressive regimes, to take up arms against these kinds of governments, such as the Marcos regime. 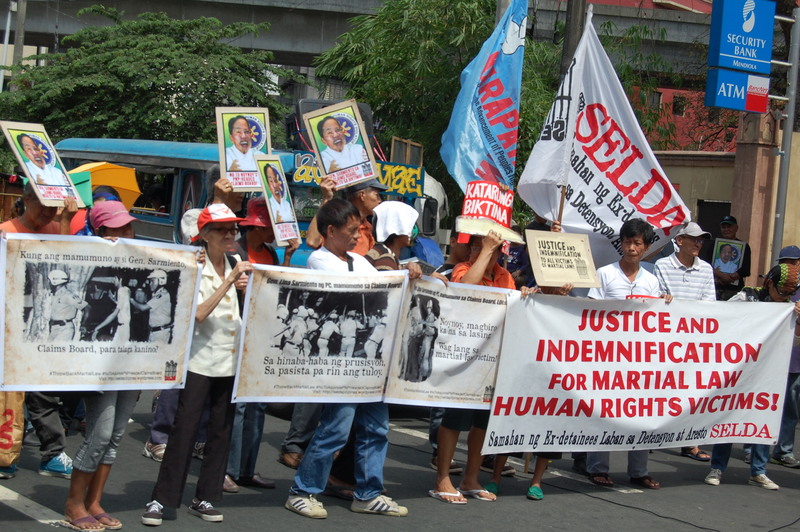 “By proposing to exclude as ‘victims’ those who took up arms and also suffered rights violations during Martial Law, Arroyo and Bello are promoting principles that undermine the struggles of the Filipino people during Martial Law and, in effect, are undermining the universally recognized right of peoples to oppose tyrannical regimes, in whatever form they deem necessary,” Palabay concluded.